- create the admin folder and put htaccess restriction on it. Write page to generate text version for inclusion in email. All field but description, include link to entry in UVic Events calendar. Met with MB and CC to finalize how to integrate information from the events calendar to the French site. Will use the same system as GRS, but were interested in also seeing a system where the links on the home page go to entries on the events page of the dept site, and the each entry in the events page has a link to that event in the UVic Events calendar site. On the GRS site, the links on the home page go to the UVic Events calendar site. As requested by the History Department I was able to add code to the Agenda web application that suppresses the second semester of a year long course, if the course information for that semester is the same as the first semester. The history department requested that this functionality also be included with the time table display in order to shrink the report. However; after doing some research into what changes would be required I feel that this would be an enormous task to take on in such a short period of time (seeing that the way that the offering lists are printed is very different from the way the time table information is displayed so I can not just copy over the code. Yesterday, after my meeting with the French Department, I was able to implement the professor specific course offering list (both on the viewing page and the report page). And I was also able to add a copy button, requested by the History Department, which allows the user to copy sequence one, in year terms, to sequence two automatically. This will be my last post regarding the French Website (unless I come back as a work study student in the fall or something). I think it would be best if the website also worked similarly to the philosophy website, where the faculty page links to another page, for example, the link could be: faculty_information.php?prof=caws and the faculty_information.php page (which would need to be created) goes and includes Catherine Caws' professor .inc file in the professor folder. The French Department is very interested in the website maintenance abilities of the philosophy website so if on Monday when I see Stewart next and he thinks its a good idea I can provide instruction on how to bring that functionality to the French Department website for easy editing. Today regarding Agenda I was able to change how the time/days is displayed. Instead of [Mon 10:00 - 11:00][Tue 10:00 - 11:00][Thu 10:00 - 11:00] it now is printed to the page like this [MTR 10:00 - 11:00]. I did have a lot of difficulty controlling the following situation [Mon 10:00 - 11:00][Tue 9:00 - 11:00][Thu 10:00 - 11:00] but working on this issue for a bit I was able to produce the following print out for this situation [MR 10:00 - 11:00][T 9:00 - 11:00]. I was also able to place the title of the course on the offerings list. So on the Agenda offerings list page if the title is less than 18 characters it will display the full course title. But if the course title is more then 18 characters what it does is the following: "Introdu...Science", taking the first 7 and last 7 characters. On the printed report; however, I have left it so that it prints the full course title as there is more room because some of the columns are not printed out. I was unable to get the professors specific course listing because I ran out of time but I will add this functionality tomorrow afternoon right after my meeting with Catherine Caws. Yesterday I was able to implement professor specific timetables for agenda. I was able to add a drop down to the timetable view so that the user can select to display the time timetable with all professors or with a specific department faculty member. Today I plan to add this functionality to the offerings list so that a course list can be printed by professor as well. Yesterday I also worked on changing the format for the display days so that it matched the requested format from the departments. I am almost completed this task. Also today I have a meeting with Lisa Surridge from the English department. 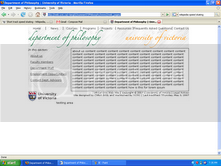 I received an email from Liz Wick regarding an error on the philosophy faculty web page. Apparently Cindy Holder's bio was incorrect (as it was a duplicate of Conrad Brunk's bio) so with Martin's help I was able to correct the professor bio and also add the CV and file information for Scott Woodcock and Allison Barnes. I had a meeting with both Liz Wick and James Young from the Philosophy Department to officially demo the new website that has been in development. The meeting went well and they confirmed that they wished that the new website replace the current website in use. After the meeting Stewart backed up the old Philosophy websites and uploaded the new website to the lang account. I then briefly reviewed the file structure with Stewart and then delivered the website maintenance document to Liz so that she would be able to learn how to properly operate the new aspects of the philosophy website. Today I had a meeting with Catherine Caws and her colleagues. We took some time to review the design I presented to them earlier in the week and they identified areas that they would like to further develop and things that they wished to change. The main changes is that they want rounded divs, the torn paper effect on the bottom of the banner as well as the top and colour changes. I spent the last day and a half working on agenda to make yet another time table display format. The first two time table formats were based on tabular vertical orientation while this time I redesigned it to use divs as well as a horizontal orientation. This new format now correctly displays start and end times based for unique zz courses. I also added a heavier font weight to the zz courses in the first two time table formats so that zz courses that may be in an incorrect place can be easily identified. The only issue I was having towards the end of the day was with printing. And I'm sure that can be fixed easily. For next week I plan to focus on the French department website and update Stewart of the progress I made with Agenda and tie up any loose ends there or with the philosophy website. Towards the end of yesterday, I attempted to re-implement the agenda time table by using Stewart's idea of having the time table display in 30 minute intervals. So, yesterday was able to remove all of the time blocks and add in each 30 minute time segment. This morning I was able to re-add the time blocks correctly, review the new code and perform some gui testing and printing. The 30 minute time intervals stretch the printed version of the time table horizontally outside of legal size paper boundaries. It does fit quite nicely on two legal size papers; however, it does look a bit odd so stretched out. After talking the layout over with Mike he suggested that if the orientation of the calendar was rotated 90 degrees and separated by day it could be easier to read and fit better on the legal size paper. If this type of calendar was implemented, instead of using a tables, divs could be used to place calendar items in the right order and in the right time location. I am going to do some testing and see how easy it would be to create this design. I added a drop down menu on the offerings list page that allows the user to select whether or not they wish to print only approved courses or all course offerings available for the calendar session. Yesterday I worked on creating a torn paper effect using Photoshop for the French website banner. I was able to create one but an issue arose with the banner width. The French department requested a banner that was the width of the browser but the banner I created was of a fixed width. The issue that arose was that stretching the banner distorted the image and creating a tiled background using css did not work either because the alignment of the torn paper was off. Greg suggested that I tear some paper and scan it in to create a banner that was abnormally wide and then place css style text on top of it. I found that doing it this was easier. After scanning it in and editing the image in photoshop, for the requested colours, I was able to implement the banner. This morning I was able to place the text/links requested in the banner and after doing so I emailed Catherine Caws so that she could look over the template and let me know what the French Department thinks. So, I will be waiting for a reply before I continue with the development of the French Department site. After adding some more documentation to the css file I will be moving back to Agenda web application to continue with my tasks there. I was having difficulty managing/maintaining my time sheets for this summer (I was using a text file, one for each week, to document my hours). I was having trouble keeping track of the running totals and I noticed a mistake (probably due to duplicating a text file to edit it for the next week). So, this morning I spent some time converting the text files into a Google spreadsheet document that automatically tabulates the running totals. I will be adding Stewart, as a collaborator, to the spreadsheet when he returns from vacation. I have been spending some time trying to replicate a banner similar to the one that the department liked at zen garden: http://www.csszengarden.com/?cssfile=200/200.css. So, I am learning how to do that torn paper affect with Photoshop at the moment. There are different ways of doing it but the one I see that will replicate it the best is with using layer masks. In my last post I ran into a blog issue with the following link http://www.litterature.uqam.ca/index.asp. For some reason, this blog would not allow me to post that link in an tag. Greg took a lot at the issue and could not understand it either. I met with the individuals involved with the redesign of the French website this afternoon to go over their ideas, suggest some cool features and ask some questions for further clarification. I used an interesting tool to demo the colours for the web pages so that we could see what the web pages would look like ( ColorPicker 3.1 ). We based the colour decisions primarily from the QUAM website here: http://www.litterature.uqam.ca/index.asp. I also informed them about xhtml 1.1 and it's deprecation of the name attribute in the tag and so as a result the FAQ page (and the other pages that use the 'name' in href attribute) will either have div expansion functionality or be separated into more pages. I suggested the idea of having the page content included (using php) into the web pages to keep editing the website content separate from editing the website design. Also I asked them if they would want me to add functionality to the web pages so that if the user clicks a button the language used on the page switches from English to French. What I want to do is have each page default to include English versions of the page and then based on a session variable set from a drop down when moving between pages it looks for the French version. I am going to develop a mock up and begin work on the rollout menu system. In other news greg ordered a keyboard for me to use that will help my wrist. Today I was able to link the conflict list page with the edit course offering page. Now the end users can click a radio button next to the conflict they would wish to correct on the conflict list page and be sent to the edit course offering page. Both the victim and assailant conflicts have this functionality. This will enable the end users to speed up the conflicts checking process. In order to do this I converted the radio button functionality of the course offerings list page over to the conflict page and also incorporated the Ajax calls which manage the menu system. Because of the change this made in the time table display and report pages I was able to condense each a-z sequence course offering to one line instead of two. This allows for a cleaner look as well as a smaller report. I also added the dagger to the spring sessions for year courses on the course offering list page to make it easier for the end user to read the report and distinguish which course is which. And lastly, I removed some debugging code in the lang02 account version added by Stewart. I figured out the issue with the lost session information. Yesterday, I logged into the lang account first, which worked, then the lang02 account and the lang02 account wouldn't work. Today, I logged into the lang02 account, which worked, and then the lang account and that failed. I next shut down the web browser and tried logging in in the same order as yesterday and I got yesterday's results. It appears that the session ids after logging into a 'lang' account will conflict with the other account if you try to log into both. I arrived in Victoria this morning and I came to the HCMC to continue working on the Agenda project and the French Department Website. I started the afternoon by updating my workstation's OS, commandeering a new mouse pad with wrist support and asking Greg to look into an ergonomic keyboard for the Mac for the remainder of my contract. I took time reviewing the French files that Stewart sent me earlier in the week as well as some of the example web pages provided. The file permissions for the development copy of the French website located on the lang02 account were changed so that I could access the web pages. I next moved onto the Agenda project and I was reviewing the time table issue regarding 'zz' courses. It was noted, by Liz from the philosophy department, that courses that started after the official start time of the block were still placed at the top of that time block and were not aligned correctly. So that any course starting at 10:30, for example, would be placed at the top of the 10-11 time block, creating the illusion that it started at 10. While this is not a bug but a feature, inherited from the previous system I noticed, while reviewing Stewart's idea for creating a 30 minute interval time sheet option to combat this issue, that within the Agenda system that there are certain times that gives the illusion that the course takes place the previous block (a more serious problem). For example, The Philosophy Department created a 'zz' course that starts before and ends after the 10:30 - 11:30 time block (PHIL260 J01 Brown, K ELL 160 (10:20 - 12:30)) and because this course does not start at 10:30 it is placed at the top of the 9:30 - 10:30am time block which is 50 minutes before the course is scheduled to begin. I think it would be a good idea to redesign the timetable view so that it still shows the block design but the courses were properly aligned (within 30 minute intervals). So that instead of seeing the above course starting, seemingly, at 9:30am it would be placed lower between 10 and 10:30am. I believe that this also would resolve the other issue reported by Liz, of a course starting 30 minutes late, as well. The only issue I see with this is if there are many courses (say 3 or 4) that start at the same exact time (say 10:30am) it may stretch the time table and it may no longer fit correctly on legal size paper. I tried to log into the the lang02 development account for the Agenda project to do some testing and I noticed that the problem that was affecting the lang account is now affecting it. So while I can log into the one located on hrd I can no longer log into the lang02 account because of the PHP session issue. I am going to have to talk to Stewart or Martin to see if I can find the new php.ini file to add it to the lang02 account so I can continue with the new changes and testing the stretchability of the time table. I sent Stewart a report on Agenda web application regarding the four points that Liz from the Philosophy department put forth about possible changes and improvements to the course listing page. I also forward to Stewart a .doc file I created for the end users of the Philosophy website regarding the maintenance of the file system as well as how to edit the web site page content. I've included a link on the login page to the document so that the user can access it easily. Lastly, for the Philosophy website I had to revalidate the all the pages for the xhtml 1.1 doctype. I mistakenly validated the website for xhtml 1.0 transitional. The major conflicts I discovered were with the forms that I used, none utf8 apostrophes and the target tags employed throughout the website. tags that were causing the form tags to not validate. And I changed all of the non utf-8 characters that were causing errors as well. The philosophy website is completed. 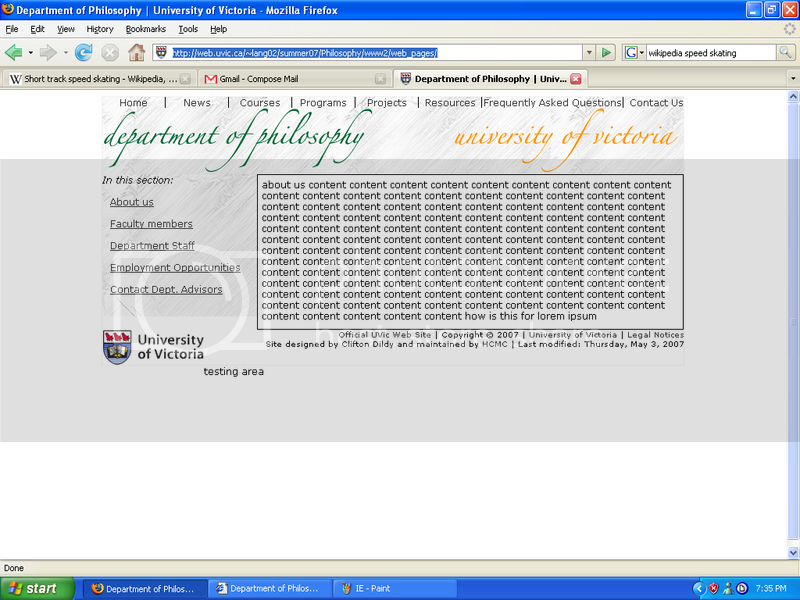 I spent the day reviewing the philosophy website and ensuring that all the pages and functionality worked correctly. I also removed all testing data from the file io elements of the website and created backups of the file io elements. I tried to find a website link for the human condition conference (linked from the events page) but I could find nothing, so I've added a small under construction page. What is left for this project is to a set of documentation for the end users on how to maintain the file io system. On Friday I was able to correct the issue on the faq.php page. I was unable to figure out what the issue was when attempting to debug the page. I basically had to rebuild it and retest it again. Today I completed finalizing the course description editing allowing. So that the user is able to edit all the course section descriptions from one location. I have completed adding the fckeditor to the following pages of the Philosophy Website: Index, news, staff, employment, new courses, events, summer courses, undergraduate program, graduate program, applied ethics, awards, faq, contact us, resources, and sophia. Users who are logged into the website will be able to use the fckeditor to edit any content on these pages within their web browser. Every single one of those pages works perfectly except for the faq page. For some reason it does not post the full contents of the text field and it adds "%3" to the end of the file. To end the day I am going to make a local backup of my work. Tomorrow I plan to test the faq page to figure out why this it is acting differently. Also I am going to be reviewing the website to ensure that all the newly added functionality is correctly implemented and reassess the completion status. From what I understand I have to add the course materials link on the dynamic course_by_prof.php page. I also received an email from Stewart regarding the Agenda project. Liz has a few recommendations for Agenda website that I am going to be looking into to see how easily they can (if they can) be implemented and present a report back to Stewart before moving forward with any changes. I want to make sure that whatever changes will not negatively affect any other department using this web application. I went through all the php folders and changed all the files to the same level of permissions (640) just to make sure that that wasn't the issue. While using firebug to investigate the header information I noticed that, on the page that is supposed to contain the listing, that the correct variables were posted from the index.php to the login.php page as well as the agenda.php. I also noticed that the "new" link at the top left of the page works if you click it (it ends up sending the user to the correct "new offering" page). This would mean that the session variable regarding the correct section of the website ($_SESSION['section']) is working because I use the session variable in an if statement to determine which section to display. I am still at a loss as to why that session variables are not displayed in the header. I noticed that you can even submit a new course offering and after you do that the correct session variable for the section displays in the header. But when I refresh the page it loses the data. I am still at a loss as to why that session variables are not displayed in the header. On the philosophy website I attempted to add course section description editing to the course section file uploading page. After doing so I noticed that I began losing track of the shared variables within that page so I decided to split the pages in two. I then found another WYSIWYG text editor (by the name of fckeditor) and I was able to implement this editor on the editing page. What remains for the Philosophy website is add a new emeritus page, add ajax to the section description editing page, adding the text editor and lastly providing user documentation. I plan to continue work on these remaining tasks. Also there have been some issues with moving agenda over to the lang account from the lang02 account so today I will be taking some time to look at the files in the lang02 account to look for any hardcoded variables that may be causing the issues. Yesterday I was able develop new functionality for the users of the philosophy website to upload new files for each particular course section. Today I spent time testing this functionality further to ensure that I corrected all the bugs I encountered yesterday. I was also able to allow for further file management by developing a way to delete the files from within the website. I am going to be looking into the following: Adding ajax to this new page to allow the switching of professors and course sections (so that course material uploading and description editing can be done at mass rather than constantly having to switch pages). Integrating a rich text editor for course section description editing. And of course documentation. Yesterday I was able to redo much of the data that was lost in the courses.php file and set up specific section information (based on professor) on the 3 course pages (generated from the faculty page, undergraduate page and graduate page). Today I was able to set up a directory structure for storing course descriptions and download-able materials based on academic year. I was able to test it on all three course pages with dummy files. I am going to continue the day by organizing the functions I created and also with documentation. Today I tried to assist Stewart with a new problem with the agenda program. Apparently after logging in the web application the php loses all the session information. At first this problem was happening only in the Lang account but it has also just appeared in the Lang02 account. While working on the philosophy website I was able to add the login file io testing I did early last week to the web pages of the philosophy website. I also started parsing the professor array to add sections to the specific courses but I was disconnected from the lang02 account and I lost all changes to the course.php file I was working on. When trying to re-add what I lost I noticed the same error that Stewart was getting appeared in the philosophy website. After trying to login to the philosophy website I noticed that it lost all the session information similar to the agenda application. Stewart will be contacting the department responsible for maintaining the servers for the lang accounts to see if the problem can be rectified. Tomorrow I will continue with adding the sections to the courses for the philosophy website until the session problem is fixed. I will be calling Stewart today to discuss the second stage of the project. I was able to compare the old website to this development one and I corrected any mistakes that I found. I was having difficult with implementing fileio yesterday. I could not get file_get_contents to work I was having array and string issues. However, by the end of the day I finally got it to work with out using the curl library. Also looked into encryption for some of the files I will be reading and writing. Today I have an assignment due for a online class I am taking at Uvic and I need to do some proof reading so I will be taking today off to complete it. Tomorrow I have a scheduled dentist appointment and I am not sure what will be done and if I will need time to recover so I decided to take the day off. I believe that I've finished stage one of the philosophy project. Yesterday I was able to implement a php array and the dynamic page that finds the courses taught by each professor. I was also able to add in the arrays that determine whether a course is offered this year or not and add functionality for the graduate and undergraduate pages to grey out courses not offered. I then commented those php pages. Today I am going to briefly review and compare the two websites to make sure I didn't forget anything. Then I am going to move onto stage two of this project. I am going to create a login page and test how file IO functions to determine if I can use the regular php functions or have to implement the curl library. I am feeling very sick today so I am taking the day off. I will resume on Monday. Yesterday I cleaned up the side navigation links and added the raquos (">>"). I completed the graduate and undergraduate course pages. I had a bit of difficulty parsing through the the course array to get the the graduate course information because I had to find their starting position and manage with multiple counters. On Monday I will be completing the professor's courses dynamic php page, finalizing some documentation and then after those two things are completed I believe the website redesign will be completed. After which I will move onto adding the ajax editing capabilities. Today I am going to attempt to complete the undergraduate course page by letting it only show undergraduate courses and also have the course information expand. Next I will attempt to port this code over to the graduate courses page so that after a bit of tweaking both courses pages will be complete. I originally had the following being generated: '$variable[$counter] = array(element1, element2...)' but i was having trouble accessing the information and towards the end of yesterday I began am trying to change that to another php array format. I plan to improve upon how PHP rips the course listing by making it so that the correct calendar year is automatically generated instead of manually entered every year. Also by fixing up the variable names and comments it will allow for easier maintenance. Lastly, perhaps I will be able to use 2 dimensional arrays to separate undergraduate courses from graduate courses. I will be talking with Stewart more about this idea after the long weekend. Yesterday I was able to recreate/restyle the static web pages. Functionality was added so that PHP to maintain the display of the last modification date for every file. I moved over the pdf and sophia files to the new development website. I am going to move onto putting in the static course pages and then begin to look at the dynamic PHP pages and what is involved in bringing those over easily. I put up the news pages but I noticed that the Human Condition Link from the live site is not working. We will have to either contact the philosophy department or locate the website ourselves to find the new link address. 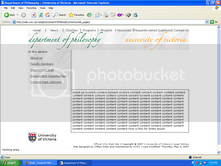 I was able to recreate/restyle the Programs pages (undergraduate, graduate, applied ethics) yesterday. It was a tedious because I was styling it so that it could be easier to maintain (as there are less html tags). Today I am going to try to finish the remaining static php pages and begin to organize how the file system will handle the dynamic php pages so that they are separated from the rest of the web site. I fixed the float:left css problem that was occurring within Internet Explorer. After much research I discovered that when you have two divs and the first is of fixed width and the second is not you do not have to float the second div. However, when the second div is of a fixed width Internet Explorer requires that you float the second div to the left as well. Firefox treats both situations in the same way so when correcting for Internet Explorer it worked in Firefox as well. I also had to fix this issue in the footer. After I corrected this issue I took time to analyze the div borders, widths, margins and paddings for the affected areas and I had to resize a few elements as I was using too many pixels for the main div which contains the website. I recreated the homepage, staff, contact, and employment opportunities web pages. I am in the process of recreating/restyling the faculty web page. After I finish this I am going to begin recreating all the other static pages and then move on to recreating the dynamic php pages. Analyzed the previous file folder structure and php implementation. Implemented a simplified file folder structure. Created a new banner image, using Adobe Photoshop, for the header. 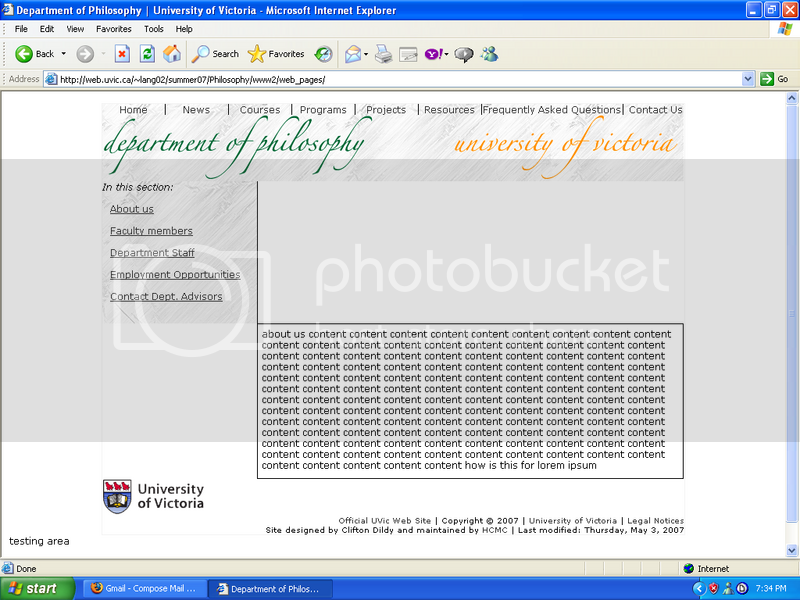 Designed basic Philosophy website template which can be viewed here (http://web.uvic.ca/~lang02/summer07/Philosophy/www2/web_pages/). After completing these tasks and testing the website in Internet Explorer 6 I noticed that it was interpreting the website in a different way from Firefox. After looking into this issue further this morning I believe there is an issue with the div sizes and how I am using "float" in the css file. As you can see from the thumbnails below internet explorer is stretching the center div as well as the footer div vertically in order to fit the content of those divs properly. Today i am going to debug the css of the website template and correct this issue before for continuing with duplicating the website.